Spock kidnapped Fleet Captain Christopher Pike, his former commander, and hijacked the Enterprise. Pike had been crippled when a baffle plate ruptured during an inspection of an old Class J starship and was confined to a wheelchair, unable to speak. Spock wanted to return him to Talos IV, where they had visited years earlier; he wished to return Pike to the Talosians there so he could enjoy the rest of his life in an illusory reality and would not have to continue enduring his disability. After a lengthy inquiry into the matter, and in light of the Talosian-provided images, Kirk allowed Pike to beam down. Commodore Jose I. Mendez also dropped all charges against Spock. While commanding an away mission aboard the Galileo on stardate 2821.5, the shuttlecraft crashed on the surface of Taurus II. Giant hostile creatures killed two crewmembers while the shuttle was stranded there. Spock, aided by Lieutenant Commander Montgomery Scott, eventually launched the shuttle. Knowing that it could not break free of the planet's gravity, Spock ignited the shuttlecraft's remaining fuel, using it as a flare. The gamble paid off, it alerted the Enterprise, which turned around and rescued the team. After being thrown back in time to Earth of 1969 and interacting with that planet's US Air Force, Spock was able to recreate a time warp with a slingshot maneuver around the sun. Later, when Kirk was court-martialed for causing the death of Lieutenant Commander Benjamin Finney, Spock proved that Finney had altered the Enterprise's computer tapes to frame Kirk. Spock, along with Kirk, helped disable a computer that controlled the lives of a civilization on Beta III and allowed no free thought or creative thinking. Spock helped Kirk to retake the Enterprise after Khan Noonien Singh, a 20th century Augment dictator whom the Enterprise's crew had found in stasis, commandeered the starship. Spock flooded the ship with gas, disabling Khan and his followers. On stardate 3192.1, Spock and Kirk were taken prisoners on Eminiar VII, which had been at war for over five hundred years with the planet Vendikar. Computers fought the war virtually so that the destruction of actual warfare did not devastate the two worlds, thus preserving both civilizations. Whenever the computer registered a hit, the affected citizens reported to a disintegration chamber and were vaporized. When the Enterprise entered orbit around Eminiar VII, it became a legitimate target for Vendikar. The war computer soon declared that a tricobalt satellite explosion had destroyed the Enterprise; as a result, Eminiar officials expected the crew to report to the disintegration stations. They abducted Kirk and Spock to ensure compliance, but the two escaped captivity and destroyed the computers on Eminiar VII. With the threat of a real war looming over the inhabitants of both planets, Spock and Kirk sought to negotiate a peace between Eminiar VII and Vendikar. Later, on the mining planet Janus VI, an unknown creature was killing miners there. After locating the creature, Spock mind-melded with it; he discovered that the creature was called a Horta and determined that its killing of the miners was an attempt to protect its young. The miners had been unintentionally killing the Horta's offspring by destroying silicon nodules which were really the creature's eggs. Spock negotiated a pact between the Horta and the miners: The miners would leave the eggs alone and the Horta, in turn, would help the miners locate valuable minerals. Spock and Kirk later became trapped on Organia, a planet of medieval culture, during a Klingon occupation of the planet. The Klingons wanted to use Organia as a base in their war against the Federation. The Organian council refused the Federation's help, and after the Klingons invaded and took control of Organia, Kirk and Spock had civilian identities imposed on them, with Spock being given the identity of a merchant. They then became involved in sabotage. After the Klingons captured them, the Organians set Spock and Kirk free. Just as war began to break out, the Organians revealed themselves to be powerful energy beings, once humanoid but now evolved. They neutralized both sides weaponry and stopped the war. On stardate 3134.0, Spock and Kirk traveled back in time using the Guardian of Forever to retrieve Dr. Leonard McCoy. McCoy had entered the time portal and somehow changed history. Spock discovered that McCoy changed history by saving the life of Edith Keeler, a social worker who, in the altered timeline, led a pacifist movement that delayed the United States of America's entry into World War II, thus allowing Adolf Hitler to win the war. Spock persuaded Kirk that allowing Keeler to die in an auto accident was only way to restore the timeline. Near the end of the year, a neural parasite that destroyed the colony on Deneva also attacked Spock. He submitted to an experiment that destroyed the creature inside him but also left him blind. However, the blindness was only temporary due to an inner set of eyelids that all Vulcans possess. In late 2267, the Enterprise encountered a probe called Nomad that had destroyed multiple star systems and their inhabitants. Spock mind-melded with the probe and discovered that it was an old Earth probe originally tasked with seeking out new life. Somehow damaged in space, it had merged with an alien probe on a mission to sterilize "imperfect" biological organisms from soil. These two missions had merged into sterilizing or improving anything that was not "perfect." Using its own logic against it, Kirk destroyed the probe. On stardate 3219.8, an alien cloud creature took control of a shuttlecraft carrying Spock, Kirk, and Federation diplomat Nancy Hedford, landing it on a deserted planet. On the planet's surface, they found Zefram Cochrane, the inventor of Earth's warp drive. History records Cochrane's death as having occurred decades ago. The cloud creature, which Cochrane called the "Companion", had discovered him and managed to keep him alive and young. The creature had brought the three Starfleet officers to be companions for Cochrane. When Spock tried to repair the shuttlecraft, the Companion stopped him. The situation was resolved when the Companion joined with Hedford, who was dying from an incurable disease, and cured her. Hedford/The Companion remained on the planet with Cochrane. In 2268, Spock and other crewmembers of the Enterprise encountered Harry Mudd stranded on a planet of androids. The androids wanted the Enterprise to escape the planet and serve Humans so that they would not have to explore space. Kirk, Spock, and the rest of the crew eventually managed to overload the androids' central control by acting in a illogical manner, causing the chief android, Norman, to have a nervous breakdown. While traveling to a peace conference on Babel, Spock was reunited with his parents. There was still much friction between Spock and his father, Sarek. When Sarek was accused of the murder of another delegate, the Tellarite Gav, it was revealed that he was ill with a cardiac defect, which made it unlikely that he could have committed the crime. Dr. McCoy was then tasked with performing surgery on Sarek for this defect while in a space battle with an enemy ship. It was then discovered that Orions were responsible for the murder, and Spock made himself available for a blood transfusion for his father's surgery because they shared the same rare blood type, T-negative. Recovering in sickbay, Sarek and Spock made peace with each other, even playfully teasing Spock's mother, Amanda. On stardate 4523.3, Spock helped foil a Klingon plot to poison quadrotriticale earmarked for the Federation world Sherman's Planet while at the same time trying to clear the Enterprise of a fast-breeding alien species called tribbles. Spock later visited Sigma Iotia II, whose inhabitants had modeled their society on the gangster era of Earth's 1930s. An earlier starship had left behind a book about gangsters from Earth's 20th century that the imitative Iotians had used as a blueprint for their society. Spock played the part of one of the bosses of the main syndicate, "The Federation," and helped Kirk unite the two warring bosses into a form of government. Spock, along with the Enterprise, encountered a space amoeba that destroyed entire star systems. The USS Intrepid, sent to investigate the phenomenon, was destroyed, and Spock felt the Vulcans on the ship dying. In order to gain information on the creature, Spock piloted a shuttle into the amoeba and found that it was about to reproduce by fission. Spock subsequently destroyed the creature with an antimatter bomb. Spock's body was later taken over by Henoch, one of three survivors of an ancient civilization that had destroyed itself. The three had become energy beings to survive, and wished to build androids to house their minds. Henoch, the rival of fellow survivor Sargon, refused to relinquish Spock's body and attempted to kill Sargon. He himself was killed with the help of Spock's consciousness and Thalassa, Sargon's wife. Spock came in contact with various other worlds in the early part of 2268. He was captured by Ekosians, who had based their society on that of Nazi Germany and tortured him to obtain information about the Enterprise. John Gill, a Federation historian, had visited Ekos and attempted to use the efficiency of Nazi Germany to bring stability to the planet. Toward the end of the encounter, it was found out that Gill was drugged by his deputy, Melakon. Through the use of the mind meld, Spock was able to help bring him to almost full wakefulness. Spock battled Kelvans who tried to take over the Enterprise in order to return to their homeworld in the Andromeda Galaxy, and helped Kirk stop Ronald Tracey, a Federation captain interfering in the planet Omega IV's societies by arming the Kohms against the Yangs. He also battled the government of a planet where a Rome-like civilization had never fallen and gladiatorial games still took place in the planet's modern era. Later the same year, Spock's brain was stolen by an alien race to help power a computer that controlled its society and provided for all its needs. McCoy was able to reconnect Spock's brain to his body with the same technology used to remove it. Spock, along with Kirk, later stole a cloaking device from the Romulans. As part of the plan to retrieve the device, he pretended to kill Kirk in self defense and romanced the craft's commander in order to gain her trust, initially intending only to carry out his mission, but finding out he experienced actual feelings for the beautiful, brilliant commander. After Kirk returned to the craft disguised as a Romulan and stole the device, Spock stalled the Romulans long enough for the device to be installed in the Enterprise. The ship escaped with the cloaking device and the Romulan commander on board, who made a pact with Spock to keep their mutual feelings for the other a secret. Spock later saved Kirk and a tribe of transplanted Native Americans when he helped save their planet from an asteroid by activating a deflector beam on the planet Amerind. He allowed the Medeusan Kollos to take over his body so that the alien could guide the Enterprise back into the galaxy after a mad Larry Marvick had driven it into an uncharted region. The Medeusans were a highly intelligent species, but their bodies were grotesque in form – so much so that gazing upon a Medeusan would cause instant insanity in humanoids. However, it is said that telepathically viewing a Medeusan's mind, as Spock did, is quite a beautiful experience. Spock helped save an landing party from the Melkotians who had, as punishment for trespassing, forced them to relive the infamous gunfight at the OK Corral in a recreation of Tombstone, Arizona. He also helped redirect an artificial asteroid, Yonada, from colliding with the Federation planet Daran V. Spock took command of the Enterprise when a spatial interphase trapped Kirk between universes. Despite a Tholian attack from Commander Loskene, Spock and the Enterprise crew managed to retrieve Kirk and escaped from the Tholian spun restrictive energy web. A race of psychokinetics later captured Spock, Kirk, and McCoy. The aliens forced them to take part in dangerous games and unwanted love affairs. After hyper-accelerated aliens took over the Enterprise, they hyper-accelerated Kirk to take as a hostage. Spock managed to receive a warning from Kirk and became hyper-accelerated himself, but carried an antidote with him. He and Kirk stopped the aliens, and retook the ship. Spock was part of a landing party aliens were using to test the worthiness of an empathic race. A super nova was going to destroy their planetary system, and the aliens wanted to see if their race should be saved. After the aliens tortured Kirk, Spock and McCoy, the empath, Gem, healed them. Impressed by this, the aliens saved her planet. In early 2269, Spock and Kirk took a new medicine that could cure mental illness to a Federation mental facility. However, under the leadership of former Starfleet captain Garth of Izar, inmates had taken over the facility. Garth captured Spock and Kirk, putting their lives in danger. Spock escaped and found Kirk but Garth, who had developed shapeshifting powers, had assumed Kirk's identity. Spock determined the real Kirk from the impostor, with a little help Lt. Rand for scratching the impostor, and subdued Garth thus giving him medication that helped his mental illness. In the same year, Spock was part of a landing party that found a Human named Flint. He found masterpiece paintings and original classical music. Flint admitted that he had been Brahms and Leonardo da Vinci on Earth, and that he was an immortal being. Spock helped Kirk negotiate a peace treaty between two societies on the planet Ardana. He also became attracted to Droxine, the daughter of Plasus, the ruler of Ardana; he referred to her as a work of art and even discussed pon farr with her. However, nothing ever came out of the relationship. The Excalbians forced Spock and Kirk into a battle between good and evil to study Human concepts. The aliens created images of people who possessed "good" qualities, such as Abraham Lincoln and Surak, against "bad" people such as Colonel Green and Kahless. Spock, Kirk and McCoy entered a time portal, and were stuck in different past eras of the planet Sarpeidon, which was about to be destroyed by an exploding sun. Spock and McCoy traveled into the planet's ice age, where they met Zarabeth, who had been sent there as punishment. Even though McCoy was dying from the cold, Spock wished to remain with the woman with whom he had fallen in love, since, in this time period, he had emotions. Eventually, he discovered the portal door and saved McCoy. After Janice Lester secretly transferred her consciousness into Kirk's body and his consciousness into her body, she attempted to kill Kirk and assume his captaincy. However, Spock managed to expose her and helped to re-transfer Kirk's consciousness into his body. Later the same year, the Federation, aware of Spock's familiarity with mind-links, offered him an assignment to work with Medeusan Ambassador Kollos. Spock, however, turned down the assignment with the ambassador due to his life on the Enterprise. Spock joined a landing party that beamed down to inspect the second planet of the Taurean system. There, he became affected by the glandular secretion of the female members of Theela's species who inhabited there, who were known for controlling the male mind. This drained Spock of his "life force," causing him to age at a rate of ten years per day. Spock escaped the females of the planet and contact the Enterprise. An all-female security detachment led by Lieutenant Uhura eventually recovered him and the landing party. By using their molecular pattern stored in the transporter system, Spock and the others were returned to their previous ages. On a mission to the planet Phylos, Spock was captured by Stavos Keniclius, an Earth scientist who planned to clone Spock and make an army of Spock clones to enforce an era of peace throughout the galaxy. His first clone, Spock Two, possessed all of the original's memories, abilities, and sense of logic. However, the cloning process left the original Spock near death. Since Spock Two possessed his progenitor's sense of logic, he mind melded with him and restored his mind, most likely transferring his katra back into the original Spock. The original Spock proposed that Spock Two remain on Phylos to help Keniclius rebuild the Phylosian society. After completing the Enterprise's five-year mission of exploration, Spock chose to return to his home planet of Vulcan. As a result of his occasional displays of emotion during his Enterprise missions, he decided to undergo the kolinahr ritual to purge himself of the last vestiges of emotion. However, Spock felt the arrival of a big consciousness; he aborted this training and resumed his Starfleet career both for personal reasons and to help Rear Admiral Kirk during the V'ger incident. His reputation remained excellent, with Commander Will Decker stating that he was "well aware of Mr. Spock's qualifications" when Spock offered to again serve as science officer; within three hours he helped Chief Engineer Scott repair the Enterprise's malfunctioning warp drive. Feeling that the consciousness would answer for his quest, he broke into an airlock and stole a thruster suit. He exited the ship and proceeded to the next chamber of the mechanism, witnessing a planet populated by living machines. There, he attempted a mind meld and he realized V'ger's quest. Knocked unconscious by the enormous power of V'ger during the meld, Spock was recovered in open space by Kirk. Later, Spock was in sickbay being treated for neurological trauma. He informed Kirk that V'ger was a lifeform of its own, seeking answers to its questions; specifically "Is this all that I am? Is there nothing more?" Grasping Kirk's hand while lying on a biobed, Spock told Kirk that the simple feeling of touching another was something beyond V'ger's comprehension. Spock later accompanied Captain Kirk, Decker, and Dr. McCoy to the heart of V'ger, guided by the Ilia probe. The group discovered that V'ger was actually the 20th century NASA probe Voyager 6. Spock deduced that the old probe was found by the living machine inhabitants of a planet located on the other side of the galaxy and they built the mammoth vessel so it could fulfill Voyager's simple programming, "learn all that is learnable." Spock told Kirk that V'ger had to evolve, as its knowledge had reached the limits of the known universe. Spock informed McCoy and the others that other dimensions and higher levels of being could not be proven logically, therefore V'ger was incapable of believing in them, needing the Human quality to leap beyond logic. Decker chose to merge with V'ger and Kirk, McCoy, and Spock escaped shortly thereafter when it and Decker evolved into another dimension. Afterwards, Spock chose to remain on the Enterprise rather than return to his homeworld, telling Kirk that his task on Vulcan was completed. Sometime after the V'ger incident, Spock was promoted to captain and assigned to Starfleet Academy, where he trained cadets on the Enterprise, which had been retired from active service. In early 2285, Spock, while on a training mission, ceded command of the Enterprise to Admiral Kirk during a mission that involved keeping the Genesis Device from Khan Noonien Singh. When Kirk and the Enterprise defeated Khan he armed the device. Spock repaired the Enterprise's warp drive– in a severely irradiated portion of engineering – in order to save the crew. He saved the ship, but sacrificed his own life in the process. Following his funeral service, Kirk gave Spock a "burial by sea" by firing Spock's body into space inside a torpedo casing. When Spock's coffin landed on the surface of the Genesis Planet, the radiation emanating from the planet caused his cells to regenerate. Meanwhile, Kirk and the rest of the Enterprise's senior staff disobeyed Starfleet orders so that they could retrieve Spock's body, and discovered that he had been reborn as a child (and was quickly aging to adulthood), but whose mind was a complete blank. On Vulcan, Spock's living body (now at the age it had been when he died) was reunited with his katra (the Vulcan soul), which Spock himself had placed in Dr. Leonard McCoy prior to his death via mind meld. After his katra and body were re-integrated, Spock began training for three months with the help of his mother Amanda to bring his knowledge and intellect back to where it had been before he died. Answering many complicated questions at rapid fire during his memory test, Spock had difficulty answering the question "How do you feel? ", something he felt was irrelevant, though his mother disagreed. Returning back to Earth aboard the HMS Bounty with his Enterprise crewmates to offer testimony in their defense to the Federation Council, Spock and the crew discovered that the planet was under siege by a mysterious alien probe, which was causing critical damage to Earth's oceans. Analyzing the transmission the probe was producing, Spock concluded that the probe was transmitting the songs sung by whales specifically humpback whales. Spock informed Kirk that the humpback whales had been extinct since the 21st century and suggested the crew travel back through time and acquire humpback whales from the past. Spock's calculations from memory for the slingshot effect around Sol proved instrumental in the Bounty's successful journey back to the year 1986. Upon the landing of the cloaked Bird-of-Prey in Golden Gate Park, Spock teamed up with Kirk and together they set off in search of humpback whales, discovering George and Gracie at the Cetacean Institute in Sausalito. Arriving at the institute, Spock jumped into the water tank containing the whales and mind melded with Gracie, discovering she was very pregnant. Later, time traveling back to 2286 with the whales and cetacean biologist Gillian Taylor, Spock and the rest of the crew saved Earth once again by releasing George and Gracie into the San Francisco Bay from the sunken Bounty. The whales successfully communicated with the probe and it left Earth's solar system. After the dismissal of all charges to the crew of the Enterprise, save for Kirk, Spock spoke to his father Sarek and asked him to relay a message to his mother – that he felt fine. 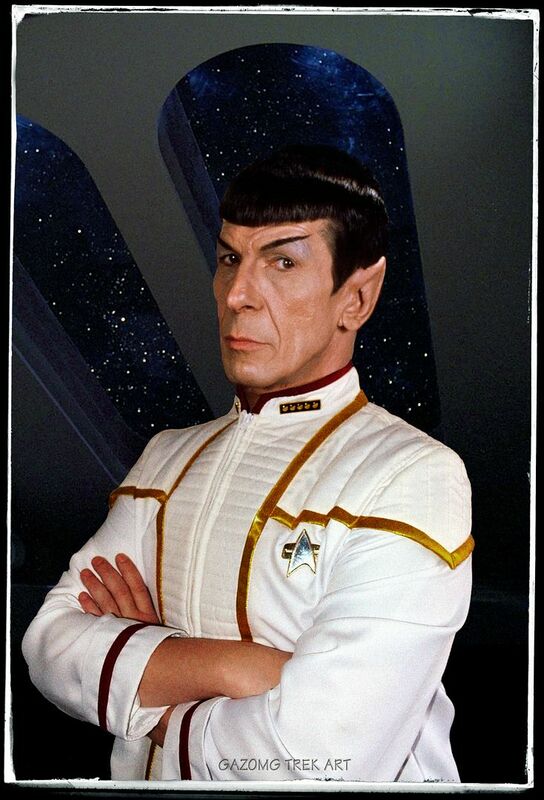 Spock went on to serve as a Starfleet officer for many more years aboard the new USS Enterprise-A. Prior to the launch of the new Enterprise, Spock was recruited to test the new brig as he was the most intelligent and resourceful person the designers could find. However, despite his ingenuity, he failed to escape. Spock joined Kirk and McCoy for shore leave at Yosemite National Park and observed Kirk climbing El Capitan with his levitation boots. He saved Kirk's life when he slipped and fell off of the mountain, grabbing his ankle just seconds before he was to be killed by the impact. Later, Spock told Kirk and McCoy that before leaving the Enterprise-A, he had studied all the details involving "camping out" and roasted a marshmallow over a fire. Spock's shore leave was interrupted when Commander Uhura brought the shuttlecraft Galileo to the trio's campsite to bring them to the Enterprise as the transporters were malfunctioning. Upon the Enterprise's mission to Nimbus III to resolve a hostage situation, the newly demoted Captain Kirk retained Spock as his first officer. He served in this capacity during the Enterprise strike team's rescue mission to Paradise City on Nimbus III. Spock discovered that his long lost half-brother Sybok had been the leader of the Galactic Army of Light, the group responsible for capturing the three diplomats. Later, Sybok hijacked the Enterprise and ordered that it be brought through the Great Barrier, something thought to be impossible. During the subsequent voyage in the shuttle Copernicus to the mythical Sha Ka Ree, Spock tried to console his brother when they could not initially find "God" on the surface. Shortly thereafter, the landing party encountered the supernatural being when it presented itself to them. Later, learning of the malevolent nature of the being calling itself "God", Sybok sacrificed his life to save Spock and his friends from it. Spock and McCoy were beamed up to the Enterprise through the recently repaired transporter system, leaving Kirk alone. The transporter was severely damaged when Klaa's Bird-of-Prey fired on the Enterprise. Spock saved Kirk's life from the entity by commandeering the Bird-of-Prey with the help of General Korrd and firing on it with the Klingon ship's weapons. Later, in the Enterprise-A's observation lounge, Spock reflected on the loss of his brother. Kirk told him that he had lost a brother once, but he was fortunate in that he got him back. Returning to Earth, Spock resumed his shore leave in Yosemite with Kirk and McCoy, this time playing "Row, Row, Row Your Boat" on his Vulcan lute. In 2293, Spock was chosen to be the Federation's special envoy to the "Gorkon Initiative" as it was he who opened secret talks with Chancellor Gorkon following the Praxis disaster. Spock later committed Captain Kirk to the negotiations with the Klingon Empire. During Kirk and McCoy's subsequent trial and imprisonment for the assassination of Gorkon, Spock took command of the Enterprise and the murder investigation. Later, he led the rescue mission of Kirk and McCoy from Rura Penthe and helped stop an assassination attempt on the Federation President. Though this mission was successful, Spock blamed himself for endangering Kirk and the consequences that followed, a guilt that lasted 75 years. In 2293, on the suggestion of his father, Spock opened a dialog with Gorkon in the hopes of initiating peace talks. He recommended an alliance between the Klingon Empire and the Federation at the Khitomer Conference, and Gorkon agreed to negotiate. His recommendation produced a major dispute because the Federation viewed Klingons as outlaws who built their empire through violence and brutality. Despite seemingly insurmountable odds, an alliance was nevertheless forged, bringing peace and stability to the Alpha Quadrant that had not existed for two hundred years. USS Voyager security officer Tuvok, a young man at the time who initially opposed the alliance, later noted that "Spock's suggestion, so controversial at first, proved to be the cornerstone of peace." Also during the Khitomer Conference, Spock opened up negotiations with Ambassador Pardek of Romulus in an attempt to unify Vulcan and the Romulan Star Empire. Spock and Sarek publicly disagreed over issues involving the Cardassians, leading to a rift in their relationship. In his later years, Spock went into semi-retirement, choosing to act as a Federation ambassador (much as his father had done). In 2368, Spock undertook a secret personal mission to Romulus, unauthorized by the Federation Council or Starfleet. As he knew it would be risky, he preferred not to involve others and wrapped up his affairs. There he acted to facilitate Romulan-Vulcan reunification, avoiding contact with the rest of the Federation as he was reluctant to risk anyone's life but his own on such a mission after the near-fatal consequences to Kirk and McCoy in their involvement in the Khitomer conference. Captain Picard met Spock on Romulus and informed him of his father's death. Before Picard's departure, the two mind-melded, allowing Spock to realize the depth of his father's feelings for him. In 2369, Spock was involved in an incident of "cowboy diplomacy" in which Deanna Troi was temporarily kidnapped to help with the defection of three Romulans, including Vice-Proconsul M'ret, to the Federation. When an unknown person was beamed on board the USS Enterprise-D in 2370, Ben told a few junior officers that he heard that this was Ambassador Spock. After Shinzon killed the entire council and Captain Picard's demotion Spock was recruited back into Starfleet by the double of his old friend with the opportunity to explore the Delta Quadrant as part of Project Full Circle. With the Romulans seeking an audience with the Federation and possibly interested in full Federation membership his presence was no longer required on Romulus in fact Senator Tomalak insisted he be elsewhere which prompted Spock to take Kirk's offer.